What is an Agricultural Health and Safety Center? Flowing grain behaves like quicksand. In 4 seconds, an adult can sink knee-deep in the suction of flowing grain. At this point, he or she can’t free themself without help. An adult can be completely buried (engulfed) in 20 seconds. Most engulfed victims do not survive. Grain exerts forces of friction and pressure on a person that prevent self-escape. A person buried to the waist in grain requires a force equivalent to their own body weight plus 600 pounds to free them. The force required to remove a person buried under grain can exceed 2000 pounds. Grain engulfment and entrapment incidents are on the rise in recent years due to record harvests, larger storage facilities, and equipment that moves grain at faster rates than ever. 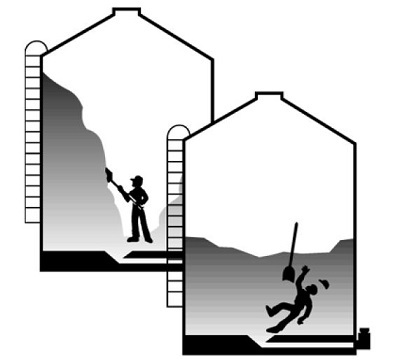 Activities associated with grain handling and storage pose a variety of risks to safety and health of workers, including entrapment and suffocation in grain, falls from structures or catwalks, entanglement in grain moving machinery, toxic atmospheres, electrocution, and dust explosions. This page addresses grain engulfment and entrapment hazards. Grain engulfment has been a recognized hazard for decades. Yet both experienced and inexperienced workers continue to underestimate deadly risks associated with the speed and force of flowing or shifting grain. 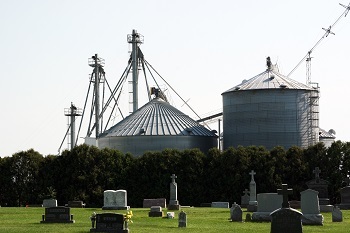 Anyone who enters a storage structure containing grain, or who climbs onto an outdoor grain storage pile, is at risk of being entrapped or engulfed in grain. Fatalities have occurred in as little as a few feet of grain. Roughly half of known entrapments occur on farms, and half occur in commercial facilities. 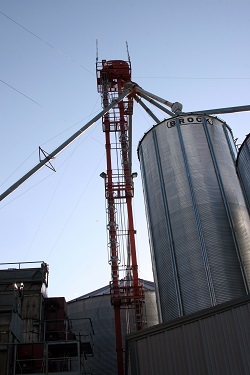 Most entrapment and engulfment events occur because workers enter a bin or storage structure to check on condition of grain or to address problems with grain flow due to spoiled grain or equipment malfunction. But other scenarios present risks even when grain is not being unloaded from the structure. Around 80% of reported engulfments involve a person inside a bin or storage structure when grain-unloading equipment is running. Engulfments in flowing grain also occur in outdoor grain storage piles, grain wagons, rail cars, and semi-trailers that unload from the bottom. As unloading conveyors or augers remove grain through the bottom outlet, a funnel-shaped flow develops on the surface of the grain. Anyone standing on the surface while grain is being removed from below is at risk of being rapidly pulled down toward the outlet in the column of flowing grain. Submersion takes only seconds and once it begins, the pressure and friction forces of grain on the body are virtually impossible for victim to overcome. If grain unloading equipment is not shut off, victims can be pulled down into the unloading conveyor, auger, or sump. Victims covered in grain are not likely to survive. Cause of death is usually asphyxiation. Spoiled or “out-of-condition” grain clumps together and can develop a crust on the top surface. This crust appears solid, but it is unstable and may hide open voids below that develop as grain is removed. Bridged grain can collapse under a person’s weight, resulting in the victim being buried by falling and shifting grain. If unloading equipment is running at the time this occurs, the victim can be rapidly pulled down toward the bottom of the bin. Spoiled grain can form a clumped mass that adheres to the vertical wall of a bin. 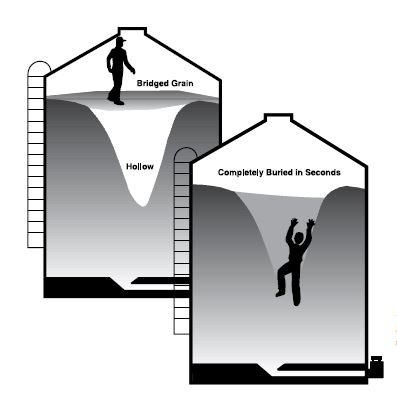 Entering a bin to dislodge a vertical wall of grain that is higher than the victim is dangerous because the grain wall can suddenly break loose and fall like an avalanche, burying or injuring the victim. Some fatal engulfments have occurred while individuals were using grain vacuums to remove grain from bins. When the grain vacuum nozzle is placed below the grain surface, a funnel flow of grain develops as grain is sucked into the tube. 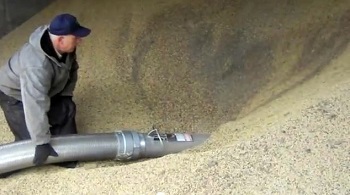 An operator can be pulled into the downward flow of grain if this nozzle is released or becomes buried below the grain surface near the operator’s feet. Maneuvering the vacuum tube can be awkward, increasing the operator’s risk of slipping or losing balance as he tries to reposition the hose in flowing grain. If the operator falls or struggles for position, his movements can trigger an avalanche of grain if the slope of grain (“angle of repose”) is steep. The best ways to prevent engulfment incidents are to eliminate the reasons for entering a bin in the first place, and to restrict unauthorized access by youth or other individuals who may be unaware of hazards. 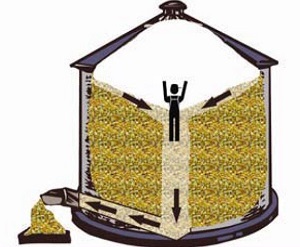 Manage grain to prevent spoilage. Store grain at the correct moisture content and temperature to prevent conditions favorable for grain to spoil and clump together. Aerate to cool grain quickly at the time of storage, remove the core of fines that is most prone to spoilage, and monitor for pests, off-odors, hot spots, and moisture content to help prevent spoilage. Work from outside the bin. If clumps or crusts develop in the grain, use a pole from outside the bin to probe or knock the clump free. Restrict access to bins, storage structures, and outdoor grain storage piles. Post signage and lock access doors so unauthorized persons, bystanders, and youth cannot enter. Post signage warning of hazards. requires any entry to be done by trained workers following safe procedures. Train workers on grain storage hazards and risks involved with entering a grain storage bin or facility. Training should include recognizing grain quality problems, entry procedures, use of safety equipment, and emergency response, before allowing access to a bin or storage structure. Training should be provided at regular intervals, not just upon hiring or once a year. Have an emergency rescue plan in place and follow it. The plan should include having cell phones on site, emergency numbers posted for local emergency responders trained in bin rescue, and prevention of untrained “would-be rescuers” who could increase grain pressure on a victim or even become engulfed themselves. Shut down all grain loading and unloading equipment (turnheads, reclaim conveyors, augers) and lock out the power sources to them. If mechanical and pneumatic grain moving equipment cannot be locked out, do not enter. Use a gas meter to check for adequate oxygen content in the bin and the presence of toxic gases like carbon monoxide (which can be present if there is combustion or smoldering grain), fumigants, or excessive carbon dioxide. If the air in the bin smells like spoiled or moldy grain, assume there are dangerous bridges or vertical grain walls that can collapse. If grain is out of condition, or the atmosphere conditions cannot be determined, do not enter. Visually inspect the interior of the structure before entering. A grain wall can collapse or a high slope of grain can shift suddenly, burying the entrant. if the angle of stored grain exceeds the angle of repose. Two outside observers must be present to monitor entry and assist by regulating a lifeline tether. One attendant must maintain constant visual monitoring of the entrant and have a system of communication worked out before entry (hand signals). Use fall restraint equipment that is properly anchored. This consists of a full body harness attached to an anchored line, and limits the distance the entrant can drop or fall in the event that grain shifts or a grain bridge collapses beneath the entrant. 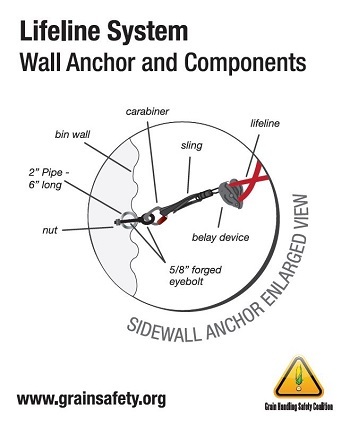 The lifeline must be secured to a sidewall anchor (not the interior ladder) or a fixed point outside the bin to prevent the entrant from sinking more than waist deep into grain. One attendant monitors the feed of the lifeline to the entrant. Never allow others that have not been trained in the steps above to enter a bin. Remember that youth under the age of 16 cannot be employed to work inside a confined space; this includes grain storage structures. A 51-minute radio program broadcast August 13, 2013 on the Illinois Public Media program “Focus”. will am 580 npr. A 17-minute YouTube video with explanation of scenarios resulting in grain engulfment hazards in storage structures, grain management to prevent conditions requiring entry of storage facilities, requirements that must be in place if entry must be conducted, and guidelines for managers to protect employees. Other grain safety hazards are also briefly discussed. Produced by Oklahoma State University Division of Agricultural Sciences and Natural Resources Stored Products Research and Education Center. 2011. A special series investigation by National Public Radio and the Center for Public Integrity examining the danger and weak regulatory response of grain bin entrapments. 2013. A 4-minute YouTube video overview describing hazards associated with grain bin entry, including strategies and procedures to reduce risk associated with entry. Produced by the Agricultural Safety and Health Council of America, the Marshfield Clinic, and the Grain Handling Safety Coalition. A PowerPoint presentation by Georgia Tech Research Institute on safe entry techniques and permit use. You Can Die in a Grain Bin in Less Than 60 Seconds. (Work in Progress) The Official Blog of the US Department of Labor. 2013. OSHA’s Grain Handling Safety Website. Entrapment Risk due to Flowing Grain. Farm and Ranch eXtension in Safety and Health (FReSH) Community of Practice. 2013. 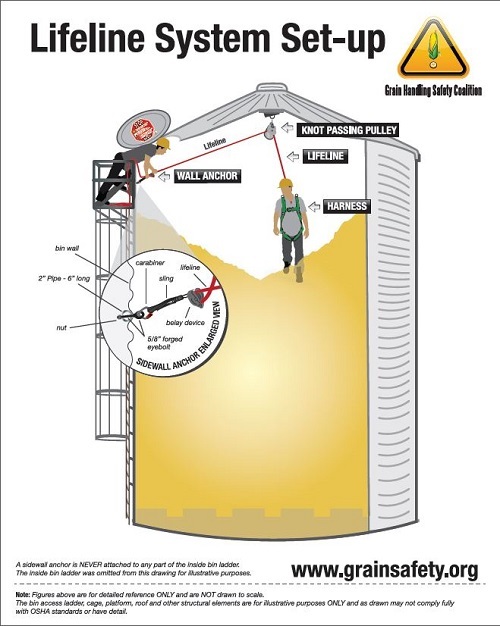 Grain bin danger – just 20 seconds to entrapment. Delta Farm Press. 2013. 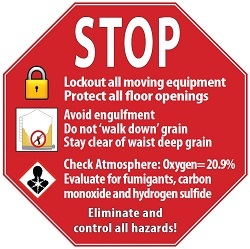 Suffocation Hazards in Grain Bins. University of Arkansas Division of Agriculture, Publication FSA1010. Grain Engulfment in Agricultural Operations. University of Minnesota Injury Prevention Project, PubH 6120. 2011. Management of Stored Grain with Aeration. University of Minnesota Extension Publication WW-01327. 1991. Buried Alive: Grain Suffocation Hazards. A publication of the Loss Control Education Unit and Public Relations Department of North Dakota Workers Compensation. 2002. 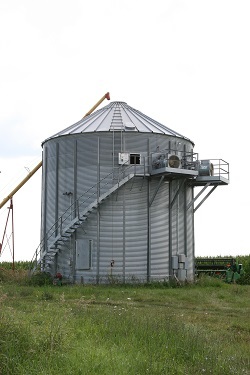 Grain Bin Safety Resources. Oklahoma State University Extension Stored Products Research and Education Center (SPREC). Grain Bin Entrapment: What if it Happens to You? A case study from an Oklahoma county elevator. Oklahoma State University Cooperative Extension Service, Publication CR-1726. Hazards of Flowing Grain. Penn State Extension, Publication E 43. 2013. Frequently asked questions about flowing grain entrapment, grain rescue and strategies, and grain entrapment prevention measures. Purdue University Cooperative Extension Service. 2011. Safety During Grain Handling, Drying and Storage. Extension publications from Purdue University Post Harvest Grain Quality & Stored Product Protection Program. NIOSH FACE Program. To search for fatality case investigations involving grain engulfment, use the “search” box and type in key words. NIOSH FACE Program. Fatality investigations involving grain vacuums include: 12IA001, 09IA012, 98IA035, 93MN007. Prevent fatalities from grain entrapment. Iowa FACE Program Hazard Alert 10-2011. The GPCAH is funded by CDC/NIOSH.